Received the Advanced Review copy of the book from the publisher, and I was so excited that I finished the book in two straight reads. It was a quick, enjoyable read. 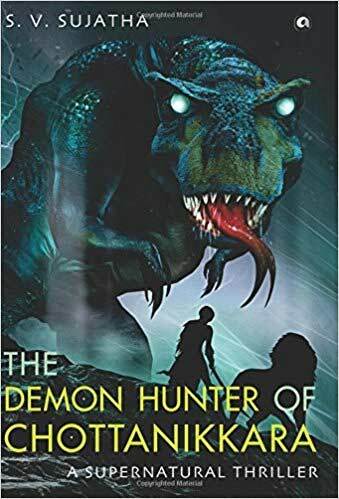 ‘The Demon Hunter of Chottanikkara’ takes place in Chottanikkara, a small village in Kerala, that is haunted by all kinds of demon. But, fear not! Devi, a young but a proficient demon hunter is there to protect the village. She, along with her Lion Ugra, has been proving more than adept in dealing with those demons, until she is warned by a Brahmarakshasa about an impending peril that is going to prove just a bit out of her league. The demon tells her she is bound to fail, and that she cannot deal with what is about to come. And, soon, the peril that she was warned about reveals itself, a demon that she finds impossible to kill or get rid of. I would not go into details of this demon, or any more elements from the storyline and spoil it all for you. You must discover that for yourself. In the meantime, let’s take a look at other aspects of the book. The author uses a simple, yet a fluent language. The way she has gone about her writing, I must congratulate Sujatha that for a debut author she has done a remarkable job. How scene invokes imagination, it’s just commendable. At most of the places, I could actually imagine myself witnessing the scenes from my own eyes. Though, I felt that she may have written the scenes well, rest of her descriptive skills lacked a bit. I would have loved it more, if there were more details about everything, from character’s appearances, to the premises. But, then, that’s my personal opinion, the author has done a good job overall. Also, the pace of the book was so good, that I never felt like putting down the book. The buildup of characters was excellent. How the background unfolds for each character, it was truly enjoyable and captivating. Not only are you able to relate to each character, you definitely develop certain feelings for them. Unlike, a lot of Indian fantasy books where characters that are so cliché and develops in an upward trajectory ALWAYS, I feel that characters in this book have a more realistic approach, thus, more relevant to the storyline. Coming to the plot and setting of the book, that’s the area where I lost it. Although, the concept was quite good, and the author did a great job in introducing elements from Indian mythology and adapting them into her own way, the actual storyline was ordinary, plot kind of weak. The major setback was that everything was so predictable, that by the time I was on the third chapter I almost guessed the whole story, and it turned out to be same. The ending was also quite predictable, but, honestly, I don’t think there was a better way to end it. However, it would have been better if the author skipped the prologue as it gave away the entire storyline, and took away what could have been a great surprise. Nevertheless, we still do get some surprise at the end of the book (though it wouldn’t be much of a surprise to those who’ve taken their mythology lessons seriously). Major disappointments: I would have loved if the author used Ugra, the lion, as more of a warrior than a mere cab service. Also, at a few places there are factual mistakes. Like, vein don’t beat, so they cannot be used to hear the beating heart, it’s the arteries. But then it was an ancient era with little knowledge of blood vessels, so it can be excused. Also, I was not convinced with the part where Devi swims across an impatient river with four spears on her back, and yet, thinks she is under armed. And, what is with that book cover? It looked more like a children’s book version of Godzilla. Anyhow, I would recommend the book to all the fantasy book lovers, who are also interested in stories based on Indian Mythology. The Demon Hunter of Chottanikkara uses a fluent language, with excellent buildup of characters. Recommend to fantasy lovers, interested in Indian Mythology.